Half a century ago, the space age was born with the roar of a mighty rocket and the beeping of the first radio message from space. America’s bold and timely leadership, embodied in JFK’s words still resonates: “We choose to go to the moon in this decade and do the other things, not because they are easy, but because they are hard…” . Today we are doing something hard, opening the space frontier for the many and not just the few and thus insuring humanity’s long-term survival. The involvement of the private sector in this new and exciting human adventure is reminiscent of the opening of the American west by the construction of railroads and the new service economy spawned by them. But traveling the vast ocean of interplanetary space requires new technologies in advanced power and propulsion, as well as radiation protection. A new advanced propulsion technology called VASIMR® and based on high temperature plasma is currently under full scale development by Ad Astra Rocket Company. The latest results of this research are exciting and bode well for the first space test scheduled for late 2014 on the International Space Station. This talk will cover the historical milestones in the development of the VASIMR®, from its early origins in the 1980s at MIT, through its formative years as a NASA project, to its technological maturation at Ad Astra. Dr. Chang Diaz will discuss its present status, major challenges and the company’s current plans for full commercial deployment of the technology in support of a rapidly emerging space market. Dr. Franklin Chang Díaz www.franklinchangdiaz.com is founder and current Chairman and CEO of Ad Astra Rocket Company, www.adastrarocket.com, a U.S. firm developing advanced plasma rocket technology with operations in Houston, Texas and Guanacaste, Costa Rica. In 2005 Dr. Chang Díaz completed a 25 year career as a NASA astronaut where he became a veteran of 7 space missions. He has logged over 1,600 hours in space, including 19 hours in three space walks. In 1994, in conjunction with astronaut training at NASA, he founded and directed the Advanced Space Propulsion Laboratory (ASPL) at the Johnson Space Center where he managed a multi-center research team developing advanced plasma rocket propulsion concepts. 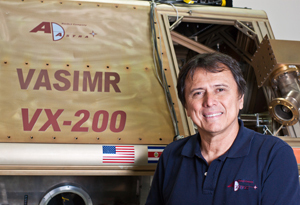 Dr. Chang Díaz is the inventor of the VASIMR® engine, a high power plasma rocket currently under development by Ad Astra for in-space applications. He has over 30 years of experience in experimental plasma physics, engineering and high power electric propulsion and 25 years of experience in space operations and the management and implementation of research and development programs at NASA. Prior to his work at NASA, Dr. Chang Díaz was involved in magnetic and inertial confinement fusion research at MIT and the Charles Stark Draper Laboratory. He is an Adjunct Professor of Physics at Rice University and the University of Houston. Project leader “Plan de Medio Siglo” Designing of a national roadmap to chart the next 50years of Costa Rica’s science and technology development. Principal promoter and coordinator of the First and Second Space Conferences of the Americas in San Jose, Costa Rica (1990) and Santiago de Chile (1993). These international events seek to encourage regional integration and collaboration in space activities among the countries of the Americas. Principal architect of the ChagaSpace Project, the first multinational space experiment in Protein Crystal Growth with medical applications by the countries of Latin America. “Science Operations in Space” NASA Documentary Video 1986, fim narrator, contributor, and producer. Dr. Chang Díaz has published numerous articles in scientific journals as well as making many conference presentations.